K-Tuned Throttle Body - 80mm UNIVERSAL - Pann Auto Performance - San Diego largest aftermarket automotive performance parts - What do you drive? 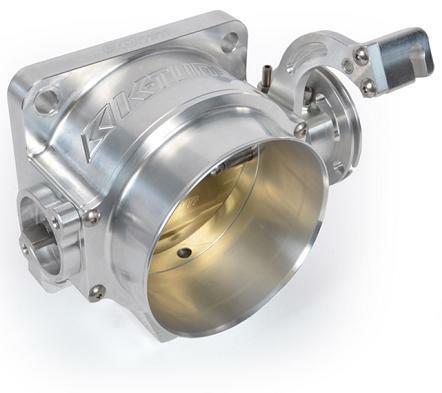 The K-Tuned 80mm K-Series Throttle Body features the largest bore of any aftermarket K-Series throttle body on the market. By using a specialized set of billet adapters we have made it possible to port out the TB opening and the IACV (Idle Air Control Valve) section on either the RBC or PRB intake manifold. This porting increases the size of the intake manifold opening and allows an 80mm TB to breathe perfectly through the off-round hole. Don’t jump to any conclusions because we have successfully re-routed the IACV ports on the TB itself, in order to keep it fully functional if desired. For setups where an IACV delete is preferred we also include 2 × 1/8 NPT plugs. The TB kit comes with a standard 80mm (3.5”) hose barb inlet, but optional V-band or Vanjen (Wiggins style) inlets are also available separately in 80mm (3.5”) sizes. These interchangeable inlets bolt on easily and eliminate the need for any welding. The throttle body and adapters are all o-ring sealed so there is no need for any gaskets. The OEM K-Series MAP sensor and IACV are both a direct bolt on, with the ports located on the bottom of the TB, where they are out of view for a cleaner look. For the TPS sensor, the initial unit comes setup to bolt on the OEM K-Series TPS sensor, but can be switched over to a B-Series TPS using our optional adapter kit. The throttle cable connection is made using a fully adjustable throttle rotor with 10 settings and a reversible throttle cable bracket. This bracket allows the user to run the cable on top like the OEM setup or tucked on the bottom. All K-Tuned Throttle Bodies are constructed with 6061 billet aluminum with a brass throttle blade and a stainless steel, center-less ground, throttle shaft that is leak tested to 90psi. They are also 100% North American made as are all the raw materials. All TB’s come complete with new hardware including: 4 bolts for mounting, plus bolts for the OEM K-Series MAP Sensor, IACV and TPS.